A programme of more than 70 sport and cultural events at Pride House will celebrate diversity and help to deliver an inclusive sports programme as part of the European Championships. 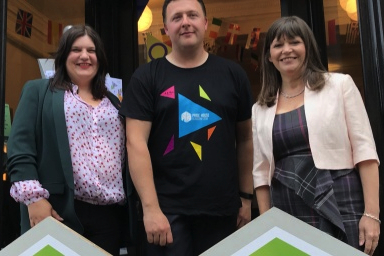 Around 80 dignitaries, community leaders and guests attended a launch event at Pride House, which was officially opened on Tuesday by Minister for Mental Health Claire Haughey and Leader of Glasgow City Council Susan Aitken. City Property has provided a partially refurbished shop unit, with new accessible toilet facilities, close to the European Championships administration centre. The venue, at 17 Trongate, will demonstrate a commitment to lesbian, gay, bisexual, transgender and intersex (LGBTI) equality on the international stage and play host to a range of sports, discussion, cultural and arts events aimed at breaking down the barriers which prevent LGBTI people from participating in sports. Led by LEAP Sports Scotland, Pride House will also provide information and advice about the wider events programme during the European Championships for LGBTI visitors, and act as a meeting space for the community. The Scottish Government is providing £20,000 whilst Festival 2018 is providing £10,000 to support Pride House and its programme of events during the Championships. “Major events like the European Championships and Festival 2018 bring together people from all walks of life and are a fantastic opportunity to celebrate Scotland’s diversity whilst we take centre stage in global terms. “From 1-12 August Pride House, which is supported by a £20,000 funding contribution from the Scottish Government, will showcase a range of exceptional artists and performers, providing the opportunity for the LGBTI community to meet and discuss some of the most important issues of the day and sending an important message on Scotland's ongoing commitment to equality in sport. Written on 1st August 2018.